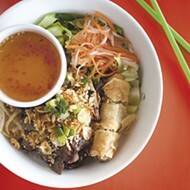 Pan fried egg or rice noodles are served with different forms of protein, such as beef pictured. 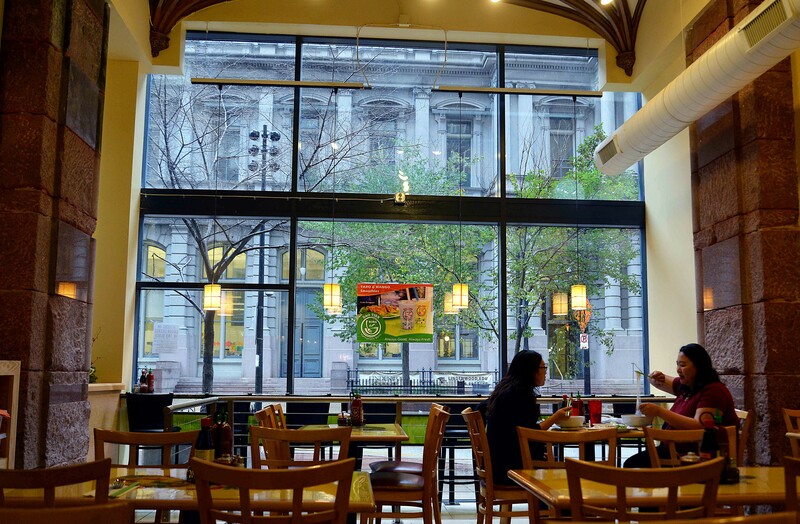 Growing up in Kansas, Sunny Dinh, co-owner of downtown's new Dao Tien (820 Olive Street, 314-405-8868), ate almost exclusively Vietnamese food. His family rarely ate out. 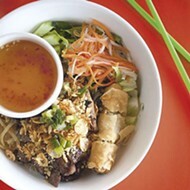 Beyond that, the previous three generations in his family made their living preparing traditional Vietnamese cuisine. His great grandmother and grandmother both opened noodle restaurants in Vietnam, with the former doing so in Hanoi during the Vietnam War, something Dinh takes pride in. "Just to open up any type of business [in Vietnam] is very difficult," he says. "My mom was able to transfer what she learned from my grandma over here." 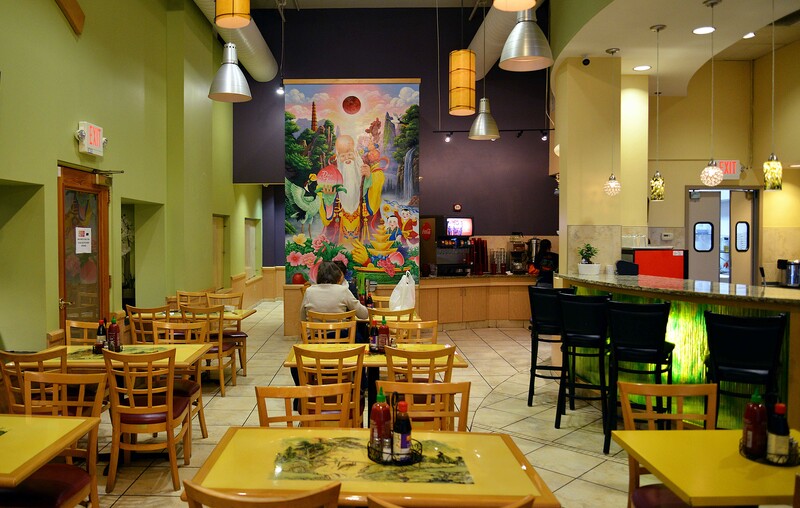 After emigrating to the U.S., the family opened a restaurant in Salina, Kansas, called the Saigon Cafe. In the mid-2000s, Dinh, his mother Diane Bui and the rest of the family moved to the St. Louis area. 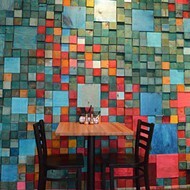 In October 2011, Bui would open the first Dao Tien, in University City. Almost exactly seven years later, the most recent adaptation of Dao Tien opened in what used to be a Sansai Japanese Grill on the corner of 9th and Olive streets downtown. 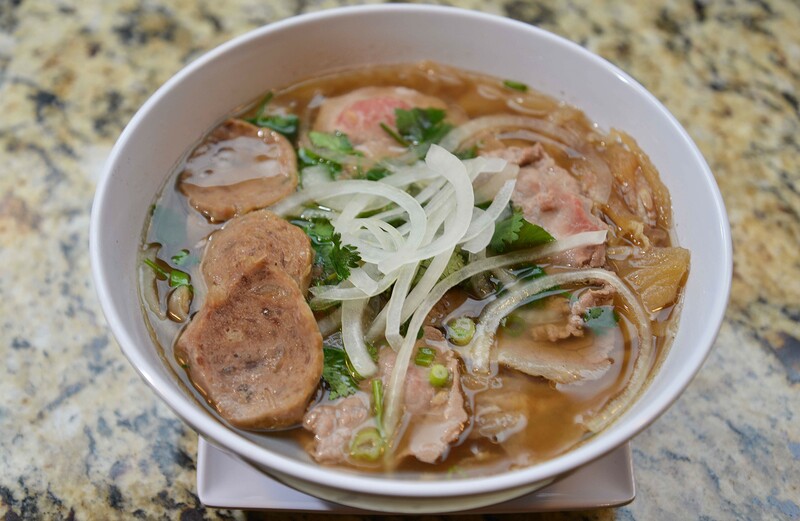 As at the family's noodle shop in Vietnam, its restaurant in Kansas and the original Dao Tien, authentic Vietnamese cuisine is on the menu. 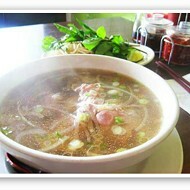 Traditionalists frequently compliment Dao Tien's phở. It's the product of an arduous process that begins when the chefs take around 100 pounds of beef and boil it over an eight-hour period in a massive pot. Three hours into the process, spices and herbs are thrown into the mix. Rice noodles, chives, onion, freshly picked basil and more make the final cut before it's brought to patrons in steaming bowls. The result of this protracted method is a flavorful, rich broth that warms the soul. The phở is loaded with veggies, beef and has a bit of a kick to it. 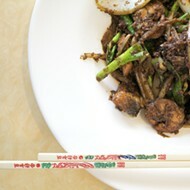 Dao Tien chefs take extra care to prepare it traditionally. 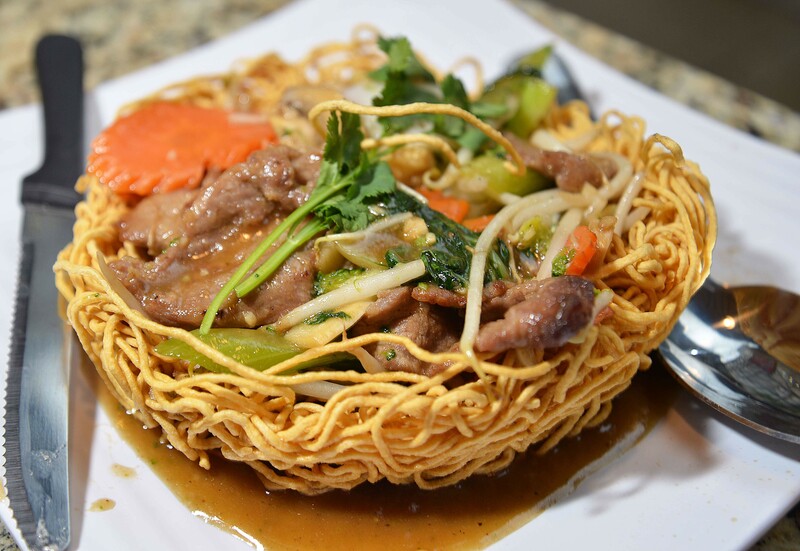 Another traditional favorite, the gà, or chicken, can be served as a soup, over a pan-fried noodle bird's nest, in a sizzling clay pot and more. But Dao Tien also wants to appeal to those who may not have acquired tastes for tradition. "We accommodate to our customers," Dinh says. Among the appetizers, cánh gà chiên (Vietnamese-inspired buffalo wings), eggrolls and crab Rangoon slightly deviate from more traditional recipes, although hints to Vietnam can still be found in each and among other menu items. The coffee, for example, is half French coffee and half Vietnamese coffee. It drips slowly through a French press for five minutes or so before it is ready to be poured over ice. The result is a smooth, refreshing pick-me-up on par with any barista-made concoction in town. 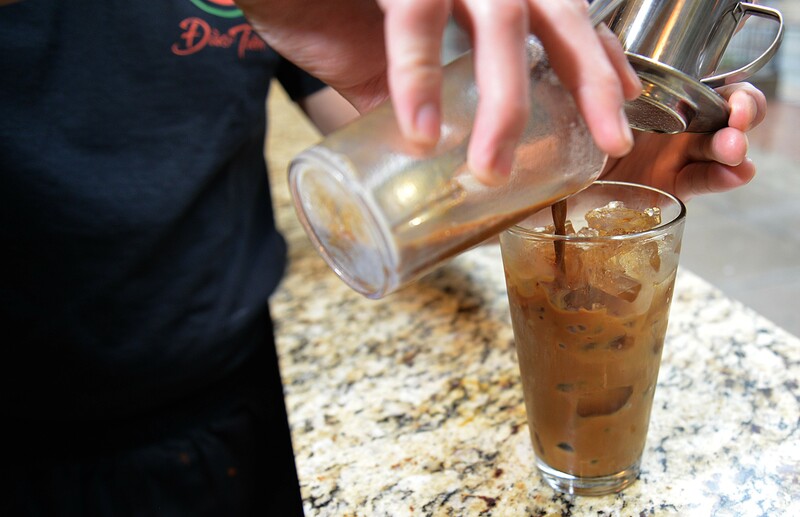 Sunny Dinh pours Dao Tien's coffee over ice after it is finished descending through a French press. Dao Tien hopes to expand its beverage options when its liquor license is approved, hopefully later this month, Dinh says. He plans a series of alcoholic boba drinks, which, he says, "will be a big hit." You may know boba best from bubble tea stands in malls and around town, but alcoholic variations have been catching on elsewhere in the U.S. Other Asian whiskeys and beers are being looked at too, which could make Dao Tien and its newly constructed bar a nightlife destination. Above all else, Dao Tien offers a tight-knit, community atmosphere. Bui greets customers by name and shares genuine conversations with them. Other regulars recognize each other and press one another for updates on work and life. The name Dao Tien has a double meaning to Bui and Dinh. In Vietnamese, it translates to "a peach from heaven," but it's also is a combination of family members' names (Dinh's sister, for one, is named Tien). "I can tell my mom is very proud that I am actually taking up what she teaches me, and what her Grandma taught her," Dinh says. 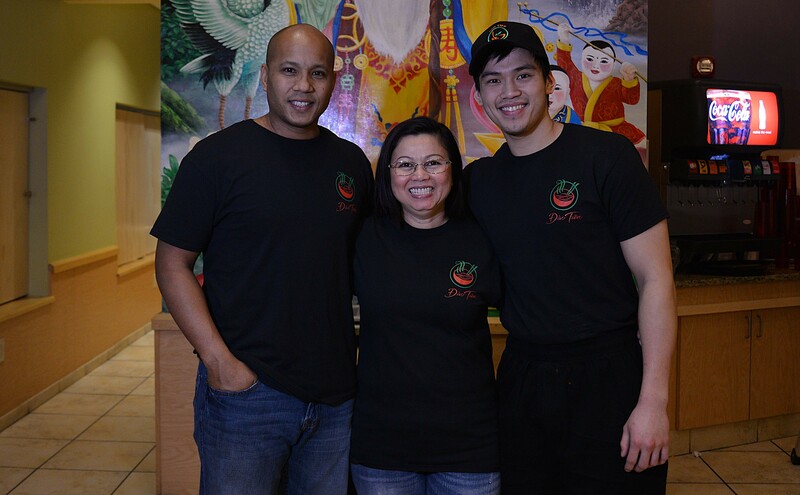 Co-owners Matt Brannon, Diane Bui and Sunny Dinh opened Dao Tien downtown on October 11. Patrons dine at Dao Tien. 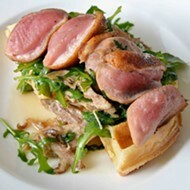 The restaurant can seat more than 100 people and is busiest at lunch, although the addition of alcoholic drinks may increase traffic at night. A newly constructed bar and a kitchen open late might make Dao Tien a nightlife hotspot.